In this story, the author parallels the story of two mothers, human and animal. Sal and her mother set off to Blueberry Hill (in Maine) in search of collecting blueberries to store for the winter. Mother wanted to can them for winter consumption. At the same time, a mother bear and her cub had the same idea to find blueberries to fill their tummies before winter arrives. It’s a cute story of how the young ones became absentminded and trailed after the wrong mothers. This story has been modeled after the author’s own family – his wife Peggy and daughter Sally. The book has simple black and white illustrations and block print, however the sketches do well to keep preschoolers engrossed in the story, as a good picture book should. There are many good teachable moments to take from this story. Here are a few ways to incorporate the story into your daily events. Circle Time Discussions — After reading the book, take time to discuss a few points related to the story. Why were Sal and her mother walking to Blueberry Hill? What was Sal’s mother going to do with the blueberries she picked? Where did they place the berries? Why did the bears want to eat blueberries? What were Sal and the little bear doing with the blueberries they picked? How did the little ones lose their real mothers? How did the mothers realize they had the wrong child? Was it a happy ending? Tell us why. 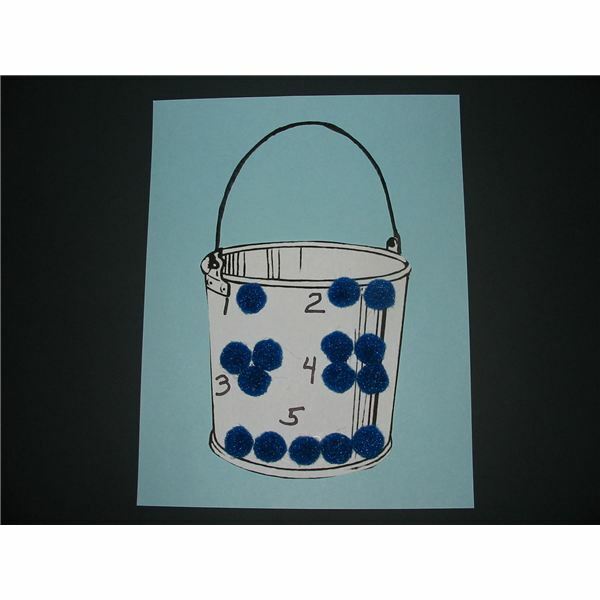 Button Game — In the story, Sal picked three blueberries from the bush and placed them into a metal pail. It made sounds; kuplink, kuplank, kuplunk. In this game, use blue buttons to represent the blueberries. Find a metal bucket or use a large commercial sized aluminum food can (from your school kitchen or ask a restaurant to donate one). Make sure the edges of the can are not sharp. Take silver duct tape and line the top edge to prevent cut fingers. Have the child stand on a line with several blue buttons in hand. Place the tin can on the floor and direct the child to pitch the buttons into the can one by one. What sounds do they make? Do they sound similar to the sounds in the story? Early Math — Practice counting skills with this math project. Draw a pail on paper and divide it into sections from 1 to 5. You can use a number of glue-on objects to complete this project, such as blue pom-poms, blue buttons, blue circle stickers, or blue thumbprints. Invite the children to glue on items in each section that match the numeral. You can consider this an art project as well. Explain how these blue items are supposed to be blueberries in Sal’s pail. Music — Sing the traditional song “Way Down Yonder in the Pawpaw Patch" changing the words to relate to the story. Where, oh where, is little Sal? Way down yonder on Blueberry Hill. Picking up blueberries, put them in the tin pail. You can change the words to “little bear" and “put them in his tummy" for the bear’s song. Closing the Unit — At the end of the story, Sal’s mother and mother bear realized their children were lagging behind and turned to see what was the matter. They ultimately had the wrong children. After a small search, each parent found their young and returned back home. The story ends back in Sal’s kitchen where mother is canning blueberries for the winter. This may be a good time to pass around a bowl of blueberries for tasting in the classroom and if you have a kitchen in your facility, think about making blueberry muffins. Take an assessment of your class by asking the preschoolers to reenact the story. What comes at the beginning, middle, and end? This classic story has been a popular book in libraries and classrooms for years.